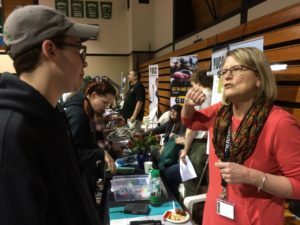 If career ideas are like seedlings, then Umpqua Community College became a giant nursery on Feb. 7 for the 11th annual Explore Event. Camas Valley freshman Riley Stutzman talks with Gwen Soderberg-Chase of DCPSS at the UCC Explore Event on Feb. 7. OSU representatives speak with students at their Explore Event booth. Students of all ages, along with their teachers and family members, took their time rotating among more than 60 booths set up in the UCC gym. Organizers said the goal of the gathering is to provide opportunities for students to start thinking about possible career fields, as well as to make contacts that may ultimately lead to jobs in various industries. 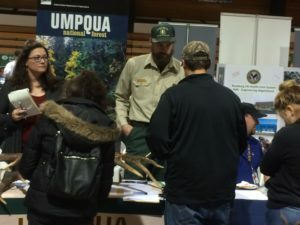 The Umpqua Valley STEAM Hub co-sponsored Explore Event 2018 and welcomed children, teens and adults to its booth. Here, visitors could find information about programs and activities of the STEAM Hub and Douglas County Partners for Student Success. They also could experiment with STEAM Hub resource lending library equipment and enter a drawing for a Sphero Mini Robot. 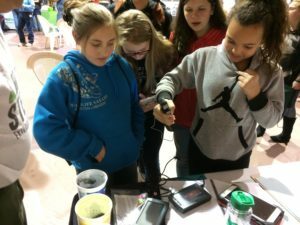 Soderberg-Chase explains the function of a Vernier LabQuest 2 to a young visitor at the Umpqua Valley STEAM Hub booth. Kids enjoyed playing with the app-controlled robot ball, which they could move by manipulating a circle on a smart phone. Young ones giggled as they knocked over miniature bowling pins with the glowing blue ball. Other students were attracted by the functions of resource lending library items, such as a Vernier LabQuest 2. 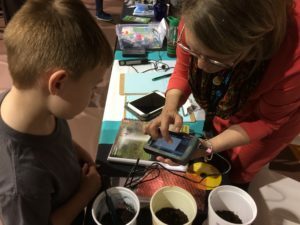 DCPSS Executive Director Gwen Soderberg-Chase demonstrated to a boy from the Calapooia 4-H group how the LabQuest’s sensor could determine moisture levels in nearby cups of soil. Randy Chase, manager of the STEAM Hub resource lending library, used a LabQuest 2 accessory to challenge a group of friends in an impromptu contest. Students test their grip strength with equipment available from the STEAM Hub resource lending library. “I’ll give free dirt to the strongest girl here,” he said, reaching for a soil cup and the Hand Dynamometer to measure grip strength. The girls passed the sensor around, comparing how their right and left hands registered on the LabQuest screen. Many booths had steady traffic throughout the evening, including the one staffed by employees of the Eugene-based timber company Seneca. Camas Valley senior Morgan Carter said she stopped by the booth to test some virtual reality equipment. She was also interested in a Seneca scholarship opportunity. “I like the sciences, but my big thing is animals,” said Morgan, 18. She said she thought she might like to be a veterinarian technician, specifically in avian medicine. 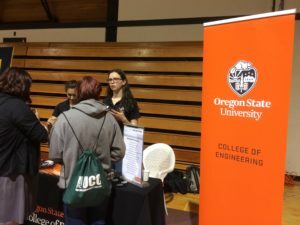 She was also checking out the Oregon State University booth as well as those connected with careers in forestry. “I think this has been a good evening, with a lot of places to visit and see what’s happening,” Morgan said. Like Morgan, Riley was on the hunt to find out about opportunities in forestry. Cyber security and engineering, particularly bridge-building, were other interests. Students check out career opportunities at one of the 60-plus booths at Explore Event 2018. He added that Explore Event organizers had done “pretty well” in pulling together a variety of booths to engage students like him who needed a little guidance. Back at the STEAM Hub booth, Soderberg-Chase said she wished she had been able to display a final schedule for the 2018 Expanding Horizon Summer Camp series, but details are still solidifying. We’ll be sharing the news about summer camps in future posts and on our Facebook page, https://www.facebook.com/UVRSH/. So please check back! 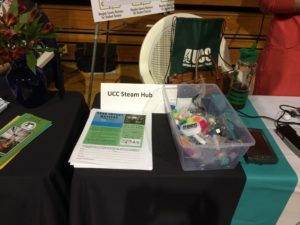 Information about DCPSS and the Umpqua Valley STEAM Hub were on hand at the Feb. 7 gathering.